Today, we’re excited to tell you that we’ve started rolling out updates to MyLibrary and MyLibrary Plus. We’ve heard your feedback about uploading, storing, and managing your images and documents in Constant Contact, and the team has been hard at work, developing an improved experience and some awesome new features. From seamless integrations with Facebook and Instagram to a huge new selection of professional stock images and more, you’ll have everything you need to create visually-appealing emails that bring your marketing to life. One of the biggest changes you’ll notice is how much easier it is to add, edit, and manage all of your stuff. You can toggle between list view and thumbnail view, and we’ve made it much easier to find your files with search and filters. 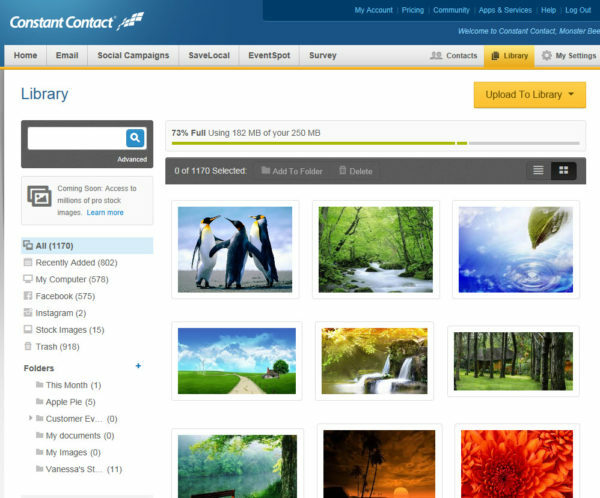 Before, you could only store images and PDF files in Constant Contact. Now, you can upload and store images, PDF files, Word documents, PowerPoint documents, and Excel files. It’s easy to select and upload multiple files at once, and you can even drag and drop files right from your desktop. Chances are that you have a ton of great images on your smartphone and on your social networks that you want to be able to use in your marketing. With the improvements to MyLibrary and MyLibrary Plus, you can. Now, you’ll be able to easily upload photos from Facebook and Instagram (MyLibrary Plus only), and with MyLibrary Mobile for iOS and Android. You can even upload photos right from your mobile device. With 250MB of storage space in MyLibrary Plus, you can store everything in one place. That means no more trying to remember where you saved that awesome picture you took last weekend. 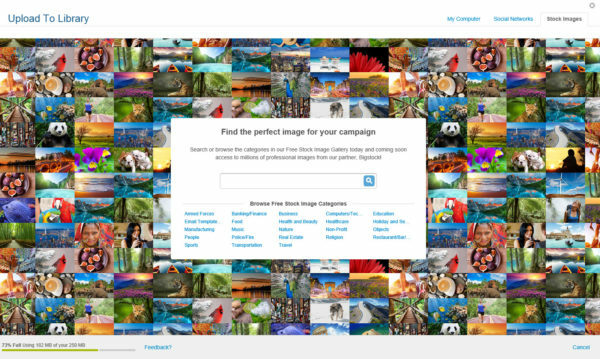 We’ve also partnered with Bigstock, a leading provider of royalty-free stock images, to give you access to millions of professional-quality images right from your Constant Contact account. In addition to all of the images that are currently available in our Free Stock Image Gallery, you’ll always be able to find the perfect image for your next email. These updates will be rolling out to everyone over the next few weeks, starting today, so make sure to keep an eye out in your account. Coming soon: We’re putting the finishing touches on the MyLibrary Mobile app and our integration with Bigstock. We will keep you updated here and on our Facebook Page when those new features are available. Check out the video below to get a closer look at all of these updates, and let us know what you think in the comments below. You’ll get:Free, award-winning coaching that’s just a call, email, or online chat away. Templates that ensure your emails are beautiful, professional, and sync with your organization’s colors and logo. I work in Product Marketing at Constant Contact. I love small businesses, Boston sports and spending time on the golf course.